The Tamil Cinema Industries lead actor, Dhanush had the popular production banner, Wunderbar films. The Visaranai movie was released in September 2015 under his banner along with the film director Vetrimaaran. Now, this movie has selected as the official entry to the Oscars 2017 Academy Awards in the Foreign Language film category. Visaranai for Oscar is one of great moment for the Tamil Cinema Industry and especially for the crew of the movie. Director Vetrimaran is one of dearest friend of Dhanush. He directed two massive films for Dhanush as Aadukalam and Polladhavan. 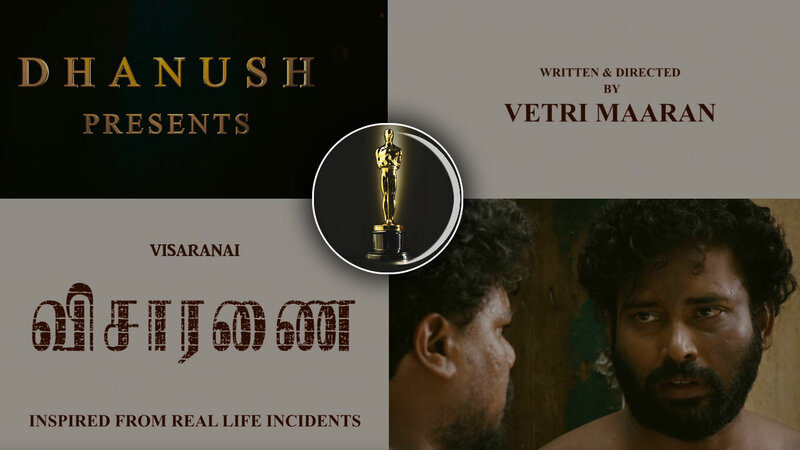 Vetrimaran paired up with Dhanush and made a real-life-based movie called ‘Visaranai.’ The movie got fabulous reviews from the critics and it already bagged various awards from 72nd Venice Film Festival, Amnesty International Italia Award, 63rd National Film Awards. Now, the film has been selected for the 89th Academy Award by the jury at the Film Federation of India from the 29 other competitive films. Officially, the Actor Dhanush thanked the important cast of the film, Visaaranai. He mentioned the following names as Dinesh, Samuthirakani, Kishore. And he especially thanked for his executive manager S.Vinod of Wunderbar Films. Also, he thanked all his fans, well-wishers, crew, press, media, and cinema fans those who all watched the movies in theaters. He added three hashtags in his press release such as #DreamBig, #GodBless, #SpreadLove. Visaranai is the story from the M. Chandrakumar’s real life novel based book, Lock up. Visaranai Oscar selection is the eighth film to be selected for the Oscars Academy Award from Tamil Films. Previously, the seven other Tamil films were selected for the Oscars such as Jeans, Indian, Kurithipunal, Devar Magan, Anjali, Nayagan, Deiva Magan. According to the report, the 89th Academy Awards event is scheduled in Los Angeles in February 2017. Actor Karthi ‏@Karthi_Offl: Congratulations to team #Visaranai It’s a great honor to be representing Indian films in Oscars. Deserving appreciation for Pure cinema! Chinmayi Sripaada ‏@Chinmayi: Already rooting for Visaranai. soundarya rajnikanth ‏@soundaryaarajni: Retweeted riaz k ahmed @v4umedia1: Whoooohooo. this is awesome !! !